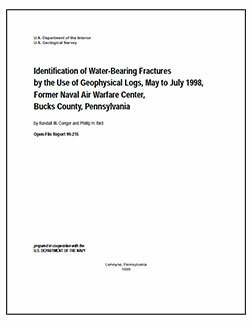 Conger, R.W., and Bird, P.H., 1999, Identification of water-bearing fractures by the use of geophysical logs, May to July 1998, former Naval Air Warfare Center, Bucks County, Pennsylvania: U.S. Geological Survey Open-File Report 1999–215, 27 p., https://pubs.er.usgs.gov/publication/ofr99215. Between May and July 1998, 10 monitor wells were drilled near the site of the former Naval Air Warfare Center (NAWC), Warminster, Bucks County, Pa., to monitor water levels and sample ground water in shallow and intermediate water-bearing fractures. The sampling will determine the horizontal and vertical distribution of contaminated ground water migrating from known or suspected sources. Three boreholes were drilled on the property at 960 Jacksonville Road, at the northwestern side of NAWC, along strike from Area A; seven boreholes were drilled in Area B in the southeastern corner of NAWC. Depths range from 40.5 to 150 feet below land surface. Borehole geophysical logging and video surveys were used to identify water-bearing fractures so that appropriate intervals could be screened in each monitor well. Geophysical logs were obtained at the 10 monitor wells. Video surveys were obtained at three monitor wells in the southeastern corner of the NAWC property. Caliper logs and video surveys were used to locate fractures. Inflections on fluid-temperature and fluid-resistivity logs were used to locate possible water-bearing fractures. Heatpulse-flowmeter measurements verified these locations. Natural-gamma logs provided information on stratigraphy. After interpretation of geophysical logs, video surveys, and driller's logs, all wells were screened such that water-level fluctuations could be monitored and water samples collected from discrete water-bearing fractures in each monitor well.